Michael Hultquist, Off Track. Belfire Press, 2011. Pp. 244. ISBN 978-1-926912-25-7. $12.99. 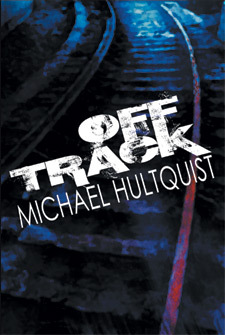 Off Track is the powerful third novel by horror writer and screenwriter Michael Hultquist, from small, independent publisher Belfire Press. Targeted at a young adult readership, this is the story of an abused boy after a stint in juvenile detention, fostered by a couple with problems of their own in a cleaner-than-thou small-town suburb. In this impossibly perfect setting, our protagonist has to deal with layers of institutional prejudice, hypocrisy, distrust, bullying, abuse and the desperate posturing of high school boys, as well as his own red-hot temper as he tries to overcome his past and adapt to a normal life. Again and again the good is balanced by the bad, as the world increasingly seems determined not to give him a second chance, even if he decides to be able to give himself one. This is not an easy book to read. Novels for a YA audience often need to make their teenage protagonists the agents of their own fate, the drivers of the storyline. They are at least partly responsible for their troubles, and they are the only ones who can save themselves; a rescue by the adults would amount to an unsatisfying deus ex machina in this genre. Accordingly, a popular theme for YA novels seems to be the abused protagonist: hurt by those they should trust, betrayed by the institutions that are there to protect them, rejected by society, and/or blamed for their own problems, they are not only unwilling to turn to adults for help out of pride or stubbornness like Harry Potter or Bella Swan, they are damaged and just incapable of trusting grown-ups or society to do right by them. Gary’s father was a violent drunk who regularly abused both his wife and son, until one night a bruised and terrified twelve year-old Gary doesn’t know what else to do but fetch his father’s loaded gun from upstairs and shoot his abuser dead. A few hours later his mother dies from the horrific beating her husband was in the middle of inflicting on her, and Gary is left an orphan, rejected by his surviving family members for what he has done. The legal system repays him for what he has been through by sentencing him to spend the rest of his childhood incarcerated in a juvenile penal institution, where he has to watch his back every day for bullying older boys, merciless guards and the mistrustful administration. The Gary who emerges from this system four years later, given an early reprieve to be fostered by bubblingly optimistic Gail and dour, mistrusting Don, is surprisingly well-balanced. We are constantly reminded that he doesn’t like to talk and has a violent temper, but we see him (and hear his thoughts) being almost entirely reasonable, and he only loses his temper under the most extreme provocation. There are no teenage tantrums, no pubescent obstreperousness, no lashing out or breaking plates or refusing to submit to discipline. Gary’s misbehavior is constrained to: (a) fighting back against bullies, sometimes with disproportionate aggression; and (b) talking back, sometimes very rudely, when faced with flagrant injustice from adults and figures of authority. Perhaps this slightly one-sided characterization is meant to highlight the fact that one of the recurring injustices in this novel is that because of his past, Gary is held to a much higher standard of behavior than any normal teenager could possibly attain. This sense of injustice is laid on very heavily in Off Track; this reader at least didn’t get the impression that Gary was particularly to blame for any of the problems that befell him, not even for refusing to talk about his past with counselors or foster parents. His job in a pizza kitchen is threatened not by his own unreliability, but by his drink-sodden and guilt-ridden Vietnam veteran boss and the lazy Mexican assistant. His relationship with his foster parents falls apart not because of his troubled background but because of their being too fragile and needy to provide a stable home for him or to tolerate anything short of complete perfection and overnight healing. His academic and disciplinary record at school is fine, but for the ineffective and fawning school counselor; his social life fails not because of his inability to make friends or build trust, but because of his one friend’s betrayal of that trust, readily given. Even his one romantic encounter is not doomed because of his inexperience or inability to relate to girls having been raised in an all-male reform school, but because the girl he falls for is much more damaged than he is. Far from being the flawed agent of his own fate, Gary is starting to look like being just a very, very unlucky boy. The writing is strong and the story compelling, but this novel suffers from an overall imbalance in pacing. It is strongest in the first half to three-quarters of its length, as Gary comes to terms with the imperfection of the world around him and refuses to be ground down by the many little problems life throws at him. As a story of a young man developing character and learning to live outside the prison he was thrown in for so many of his formative years, this is a convincing, sympathetic, complex and profound account. Painful in places, filled with little sparks of joy and optimism in others, it is a truly beautiful read. For the last act, however, we are introduced very quickly to what feels like the core of the story, the true dilemma that will test Gary’s character, and the climax and resolution hurtle upon us more rapidly—and so less convincingly—than the build-up. (This impression may at least partly be caused by the marketing of the book: the publisher’s suggested tag-line—which I’ll not repeat here—reflects an event that is introduced in the final straight; the train tracks of the title and the front cover don’t play any significant role until the last few chapters.) As events spiral out of control toward a seemingly inevitable tragic climax, it cuts off with shocking suddenness, leaving the climactic sentence looking almost like a punchline, and the reader reeling from the unresolved action that even the chirpily optimistic afterword cannot remedy. I may have suggested above that this novel has a “popular theme”, and have highlighted problems with characterization and pacing, but I don’t want to leave the impression that I did not find this an ultimately successful book. Gary is a very likeable character, and his self-torment is convincing and agonizing. The hideous events that unfold (or are present from the start) are never laid on thick, but rather build up with sinister hint upon subtle detail and leave a profoundly oppressive mood with the reader. Off Track is certainly not a book for the faint-hearted—I’m just glad that kids these days are made of sterner stuff than I am. Thank you very much for your thoughtful review of my novel, "Off Track". I sincerely appreciate you taking the time to read my work. I feel like you truly understood what I was trying to say in the story, and that means so much to me. Take care.